This humorous video shows how graphic designers and clients see projects differently. Everyone from the most seasoned creative director to a graphic design graduate fresh out of college knows that creatives and clients don't always see eye-to-eye. 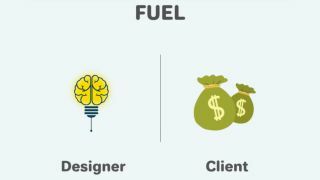 While designers will value innovative ideas highly, they're not worth anything in a client's eyes if they don't directly make them money. This difference of values can be frustrating at times, but this short animated video made by design resource website pixelo manages to find a funny way to look at them. Covering everything from their respective roles, to how they see colour and typography, this clip reveals the contradictory outlooks of graphic designers and clients with beautifully realised animations and icons. Now this doesn't mean that every client prioritises profit over imagination, or that graphic designers are creatively incompatible with a business mindset, but we're sure you'll agree that there must be at least a grain of truth behind this video. The fact that clients are impressed by designers' use of software they've never heard of is at least a reason to feel smug. If you liked this video, pixelo has a load of others over on its YouTube channel, such as Top reasons not to date a graphic designer ("They want to save the world with a post" admittedly being a pretty good reason) and The difference between art and design (Good art is interpreted, while good design is understood, being a useful mantra to trot out to relatives who don't understand what it is you do).